Join the Friends of Hackmatack National Wildlife Refuge for a hike on the first piece of Hackmatack NWR to be open to the public! The hike takes place on Tuesday, September 11 from 6-7:30 p.m. at N541 County Highway H, Genoa City, Wisconsin. You will be able to enjoy a tour with expert guides and be able to meet the new US Fish and Wildlife Service refuge manager, the first official employee for Hackmatack NWR. The Genoa City Tract, just northeast of Genoa City on Highway H is the locaiton of this unique opportunity. 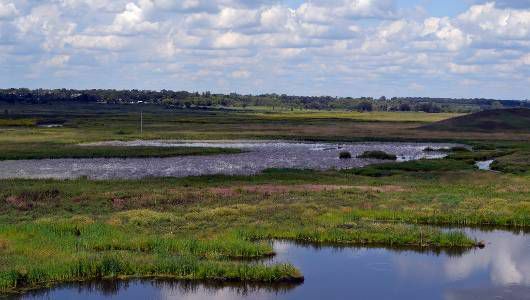 The 86-acre tract was acquired by Ducks Unlimited in 2013 who restored farm fields on the site to wetland and prairie habitat. The site also features a woodland area with an amazingly intact and diverse understory of native woodland flora. The property is managed by the US Fish and Wildlife Service as an official piece of Hackmatack NWR. Directions: Turn in the lane at the New Hackmatack National Wildlife Refuge sign and follow the signs to parking. Wear sturdy shoes or hiking boots. Light refresnments will be served. This event is sponsored by Friends of Hackmatack National Wildlife Refuge, a non-profit group whose purpose is to connect people to the refuge and conserve and enhance the natural and cultural resources, rural character and scenic beauty of the refuge. Contact the Friends for more information at 262-448-3558.